It’s hard to figure out the exact moment when I decided not to be an anthropologist. This was the distinct career direction I had finally chosen by the time I actually made it to Columbia University as an undergraduate eight years after my departure from high school. It might have been the precision necessary to measure brain cases, one by one, for a required course in physical anthropology, or the arduous memorization of lemur species and their diets, a task I insisted on documenting with the creation of the Lemur Culinary Gazette, a project my professor did not have the patience or vision to appreciate. While neither of these endeavors in the field were particularly suited to my temperament, I believe that the most likely moment of my breakup from Anthropology occurred during a senior ethnography course, where we read an ethnography primarily focused on the study of pee. You must understand that there was a certain degree of social pressure here for me to explore this particular profession. I was the daughter of one anthropologist, the sister of another, and I had few marketable skills other than my immense aptitude for people-watching, my expertise in bread-baking, a certificate in Wilderness Survival from a seventh-grade Girl Scout camp, and, from a parental perspective, an unnerving eye for adventure. It really was probably the only profession that would have me (apologies go out to aforementioned family members and other sundry parties). Still, when faced with the charts and graphs of highway restrooms and floor plans of public toilet stalls, I became completely bereft. The world of Levi-Strauss and Evans-Pritchard, which I had longed to inhabit as student, observer, and participant seemed remote, distant, downright unreachable. Where were the Azande? How was it that Levi-Strauss’ Tristes Tropiques had been delineated from my future so quickly by the terrible calculus of colonialism and industrialization? I had imagined a life of rucksacks in Appalachia, conducting follow-up documentary footage of the Holy Ghost People, or traveling with the Tuareg on salt-routes into southern Mali to understand their unique sense of lineage—only to find that neither of these projects was possible any longer. It amplified the horrifying sadness I had been experiencing since childhood when thinking about the loss of indigenous cultures which was the very reason I felt a sense of desperation to document and observe the world in the first place. Here was what we were, and what was left to study. There seemed to be no place for me. And so, I became a writer. It hasn’t been a bad life. Neither profession would pay the bills. Still, there is a deep curiosity that lies beyond the page, and it still nags at me. I haven’t entirely known how to answer to it. Last fall I was invited to take a three day backpacking trip to Deer Creek, about thirty miles northeast from my home in Chico and “four sleeps away” from Mt. Lassen, as Ishi, the last Stone-Age Indian left in California, might have said. I was on an expedition with photographer Byron Wolfe, my poet-boyfriend Troy Jollimore, and Dave Nopel, who grew up in the area and whose father, John Nopel, was a noted local historian. Dave and his sweet lab Mindy served as our guides down into the area, a 2,000 foot drop from the crumbly road through a tangle of manzanita and poison oak. We were working on a collection of photos, essays, and poems for a project dreamed by Byron which we refer to as Vanished that marks local iconic features of the geographic and cultural landscape no longer existent in Northern California. Byron was there to rephotograph the area where Saxton Pope, Alfred Kroeber, and Thomas Waterman initially photographed Ishi in a variety of staged photos to recapture the landscape and practices of the vanished peoples of his tribe and so many others. Troy was there to write, and I was there because, like Mindy the dog, the idea of the trip woke something up inside of me. I have much to say about Ishi and what I learned there, far beyond the scope of this essay. But what was incredibly haunting was the immense sense of complexity I felt while in the very spots that Ishi had made his home for years. It was beyond moving to stand in the very spot where he once stood, to feel the creek pressing on my calves as he once did, to sleep beneath the same buckeye snapped in a photo a hundred years before. I wanted so terribly to look into that past, to touch it for all it was, to sense it, to be inhabited by it, to swallow it. In Theodora Kroeber’s book, Ishi in Two Worlds, she illuminates Ishi’s life on Deer Creek and his subsequent years in San Francisco after his starved and exhausted surrender to white society in Oroville, CA in 1911. The period of silence Ishi and members of his family endured in mortal fear of discovery by the whites lasted about twelve years, a time which Ishi himself referred to as “The Long Concealment.” Kroeber accounts, “Their trails went under the heavy chaparral, not through it, and they traveled them on all fours. A cow could not find such trails; even deer sought more open ones…They never chopped; the sound of chopping being the unmistakable announcement of human presence.” It was almost paralyzingly sad to be in that landscape, to see the trails, to try to fit my body between the branches without bending them or making a single sound, to understand much more fully how the smallest chimney of smoke would hail the whole end of an era for a people already almost completely disappeared. I was struck by my intense desire to write, to make something that served as ethnography and lament at the same time, to both chronicle and cry. One of the most fundamental griefs of losing languages and cultural practices and rituals is how little curiosity the homogenized world requires. It isn’t a place where there is attention to intrigue and understanding. We have reconciled ourselves to understanding our individual selves, and this simply isn’t enough. We enter a kind of low-level sleep, which allows us to nod off during the constant and steady stream of vanishings. We are both simultaneously reconciled to the disappearing vestiges of the old world and hell-bent on the acute documentation of the new. Levi-Strauss knew this; in the final pages of Tristes Tropiques, first published in 1955, he writes, “Even if the rainbow of human cultures should go down forever into the abyss which we are so insanely creating, there will still remain open to us provided we are alive and the world is in existence a precarious arch that points towards the inaccessible. The road which it indicates to us is one that leads directly away from our present serfdom: and even if we cannot set off along it, merely to contemplate it will procure us the only grace that we know how to deserve.” Written language, I like to think, could still be an act of hopefulness, a stand in the arch. It provides a concerted study and articulation of longing, and despair, of nostalgia and disappearance, of the inaccessible. In doing so, perhaps it can break us from that serfdom of sleep, providing a quiet and purported way to take stock before the next wind comes up off the creek. Poetry attempts to weaken the despair of loss and to document it with beauty and presence in a kind of archive that does not simply disseminate information. Like the art of rephotography, poetry demands that we make note of even the minute differences in geographies, even when it seems that the landscapes around us are flattening under our feet. 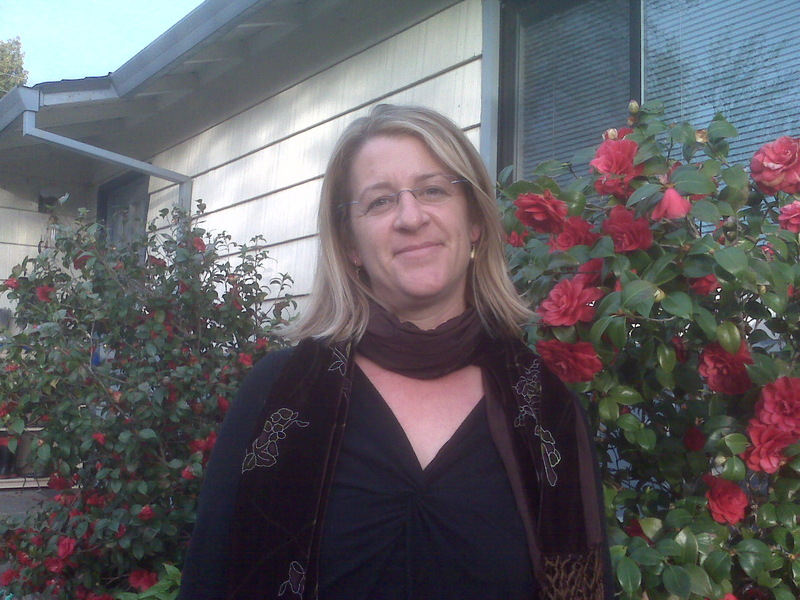 Heather Altfeld teaches in the English Department and the Honors Program at California State University, Chico. Her recent and forthcoming publications include poetry in Narrative Magazine, Pleiades, Poetry Northwest, ZYZZYVA, Sow’s Ear Review, Greensboro Review, Squaw Valley Review, Jewish Currents, Laurel Review, The New Guard, and Zone 3. She has completed her first book of poems and is currently working on a second book of poetry and a book of stories for children. For more work directly related to the essay above, look for Heather’s poem “A Letter to Saxton Pope” in the current issue of ZYZZYVA.